Today I looked around at my scant decorations when my eye fell on three sad looking stockings hanging limply from the table. Why are they limp? Because they are empty, and then I had a realization. 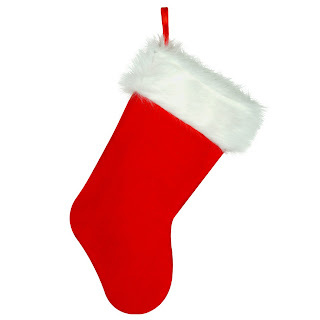 I don't have any idea what to put in our Christmas stockings! Last year it didn't really matter because My Love and I did our shopping at 11:30 Christmas Eve (gotta love Walgreens) and The Boss was only 2 months old. Now, however, I am having serious concerns. This is what my aprents STILL put in our stockings: toothpaste, toothbrushes, chapstick, gift cards, hand lotion, stuff we actually use, but it's pretty cheap and takes up space! We get some of the above mentioned things in our stockings as well. We also get a new pen(s), our favorite candy bar, altoids or mints, and whatever little items are specific to our interests or needs. (I usually get a little eye-make-up in mine.) For kiddies chocolate gold foil coins or pez are pretty fun, or a little board book or something. Enjoy! My parents always did nuts, candy, and an orange. I personally believe in nuts (pistachio cause you can get them open without hunting for a hammer and they are the yummiest and worth the splurge), chocolate oranges - who said they weren't nutritious?, real oranges and candy. I obviously don't have a problem with putting candy in stockings. That's what they are for - a personal stash of candy for the next two weeks (or two days if you were me). Great for making chocolate oatmeal with for your siblings by the way.